Once more a disaster is centre-stage and slowly, as before, attention shifts from the challenge of response to the failure to prevent. The destruction wrought by typhoon Haiyan has yet to be fully understood, and the total cost, in terms of shattered lives and financial loss, can still only be imagined. What we know is that Haiyan, one of the strongest storms on record, and the storm surge created by the funnelling of water in Leyte Gulf, has created a level of devastating impact usually reserved for tsunamis. Before and after photographs are similar to those we saw in Aceh after the 2004 Indian-Ocean tsunami, villages wiped from the landscape, cargo ships piled up along the coastline. That this has happened in the Philippines is somewhat perverse. 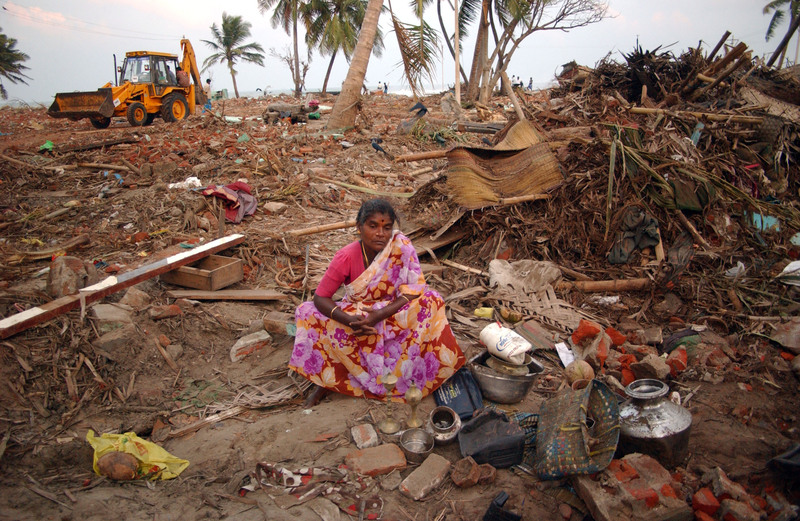 Disaster risk is built into the country’s development planning, and considered as a threat to national security. Politicians better have disaster prominence in their manifesto if they want to be elected. The government is investing heavily in risk reduction, close to $1 billion a year. And, perhaps more important, disaster risk has entered civil consciousness; prevention and preparing for the regular impact of typhoons, landslides, flooding and earthquakes is of central importance across society. What does it mean for the international community when a country with arguably one of the most advanced risk management legislative frameworks, a committed government, significant national investment, and often deemed a success story, is unable to both prevent a disaster of this magnitude and to comprehensively prepare? And what does this mean for other contexts? While the Philippines provides a rare example of a country with proactive investment into preparedness and risk reduction, in other countries wherein risk is not a core part of their development approach, the state of preparedness is far less evident. Part of the challenge lies in the financing architecture, with overseas development assistance for emergency preparedness largely deriving from humanitarian financing mechanisms that are released only in the aftermath of a crisis. While this reflects a long history of calls by humanitarians to seek ways to stop the cyclical nature of response – and be better prepared for that response - it does little for the communities or states at risk. There has long been the call for a fundamental mind-set change, and with this transformation of the financing architecture; a move that would take developing countries closer towards the Philippines model and see stronger commitment to preparedness and risk reduction. We need to apply the same logic as the donor governments do in their own constituents: to invest in early warning systems, search and rescue, build capacity for response, devise contingency plans and train personnel to cope with the range of likely risks to be faced. In some regards this is a matter of equity – to support action that we would warrant as necessary of our own constituents. In other regards, this is a matter of economics; it is more cost effective and cost efficient to invest in preparedness as opposed to response only. And yet international funds devoted to disaster prevention and preparedness are a small fraction of what is spent in reconstruction and response. Latest research shows that if you combine the financing of 12 of the poorest countries, for every $1 on disaster 'risk reduction', $160,000 has been spent on disaster 'response'. A matter of humanitarian aid or development? What does this mean in practice? While the response to typhoon Haiyan calls heavily upon the international community in the immediate aftermath of the disaster, the impacts have undermined development progress and will continue to set back progress in the future. Understanding risk, being ready for crises and establishing systems of preparedness for emergency response are therefore the responsibility of all: nations, humanitarians and development actors. As we have seen in the Philippines, emergency response requires near term preparedness activities (e.g. stockpiling of food and non-food items); it also requires a history of investment to enable longer term preparedness to be established, and to be effective and efficient in a crisis (e.g. legislation and budgetary measures to resource these activities). The activities required across the ‘preparedness continuum’ therefore span the humanitarian and development divide. Without more effective and scaled up pre-disaster preparedness measures, vulnerabilities will persist and humanitarian needs will continue to overwhelm the limited resources and recovery capacities of local, national and international actors. However, choosing to deploy or prioritise resources to reduce risks and prepare for disasters presents significant challenges for policy makers. Limited resources and heightened donor expectations provide a difficult context in which to make the case for a new approach. Notwithstanding, a new approach is what is required. First, a paradigm shift to foreground emergency preparedness in the current response-dominated approach is paramount and a more holistic appreciation of the role of preparedness in humanitarian initiatives is necessary. The way funding is currently structured impedes that holistic approach. However, to separate out preparedness activities to fit existing bifurcated aid structures would simply reinforce an unhelpful humanitarian response/development divide that accentuates short-term, disjointed planning. To bring together preparedness activities as a discrete set of issues risks creating (yet) another silo. Moreover, humanitarian aid budgets are finite and will be more likely under acute pressure in years to come. It is therefore safe to say that the solutions lie in making more efficient use of existing mechanisms, humanitarian and development, and creating incentives to prioritise preparedness action. Of course, as the Philippines exemplify, the head start given by preparedness does not remove the obligation or imperative for donors or agencies to respond to emergency needs in these countries. It does mean, however, that any such response will be able to meet needs in a more timely, appropriate, and effective manner; in contrast to no preparedness having taken place. Secondly, a more integrated operational response needs to be found that works to support cost effective pre-emptive action. As noted by the World Bank President, the humanitarian landscape calls for a new approach to ‘shift from being crises fighters to proactive and systematic risk managers.’ Investment in preparedness should be based on a global, regional, national and subnational assessment of risk, related to vulnerability and capacity in country. Such an assessment would allow for better prioritisation of resources where the need is greatest. In high-risk countries, humanitarian and development actors need to work together to develop and support coordinated multi-year and multi-stakeholder systems that integrate preparedness, based on a collaborative and coordinated understanding of risk. As our thoughts and action return to the immense task at-hand to restore some degree of normality to those affected in the Philippines, experts warn that the ‘one off events’ could well become the norm. While attribution to climate change is extremely complex, we can know that the complicating impact of climate change on disaster extremes in the Philippines poses difficult questions for the humanitarian and development communities going forward. What is clear is that system change is needed: we need wait no longer to realise that fact. By Katie Peters (Research Fellow, ODI), Jan Kellett (Senior Research Advisor, ODI), and Sandra Aviles (Officer-in-Charge, FAO Office in Geneva, and IASC TT Chair for Funding Preparedness). A new report launched on 9th December 2013 by the Overseas Development Institute will set out a new way forward for the current state of financing of emergency preparedness.